Peyton Ashby meets prospective employers at a job fair for gender-diverse people. Peyton Ashby has never met another transgender person. On a Wednesday morning, she sets out across a room of more than 500 trans folks, all of them here in search of a job. She can’t help but make friends along the way. 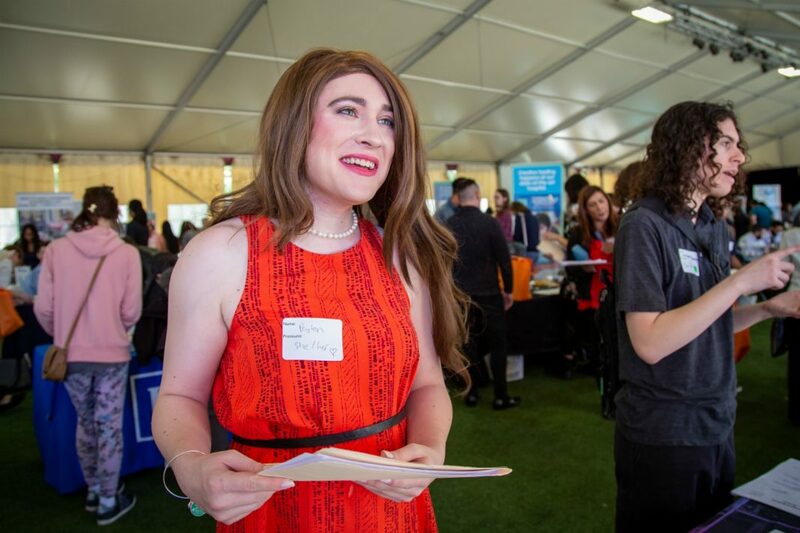 More than 75 employers cram into the tent for a transgender job fair hosted by St. John’s Well Child and Family Center and Trans Can Work. 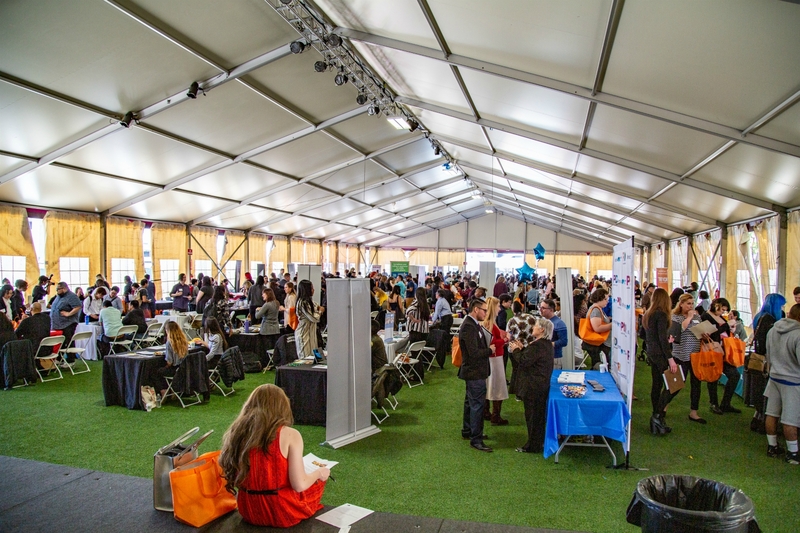 Organizers believe it’s the largest trans career event ever hosted in Los Angeles. Finding employment as a trans person is no small feat. Many non-cisgender people report hostility in hiring, yet only 21 states and Washington D.C. have job protection laws on the books, California among them. According to a U.S. Transgender Survey conducted in 2015, trans people are three times as likely to be unemployed as the rest of the population (at 15 percent). That same report found almost a third lived in poverty. 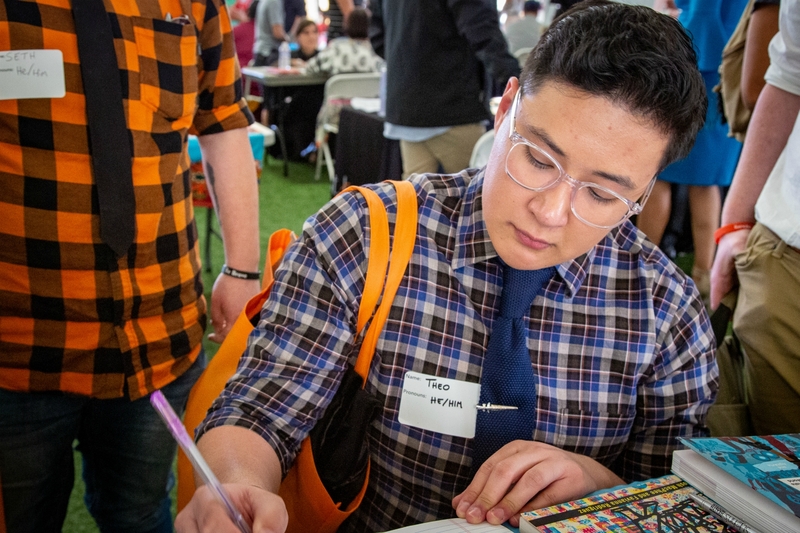 George Luna-Peña, program manager for the diversity apprenticeship program at DTLA art museum the Broad, is aware of the trend and wants to change the fact that art handling is typically dominated by white men. He passes out 150 applications for eight positions. Approximately 85 percent of the candidates he met would be a good fit for the program, he says. Ashby, however, is here looking for a job working in cosmetics. 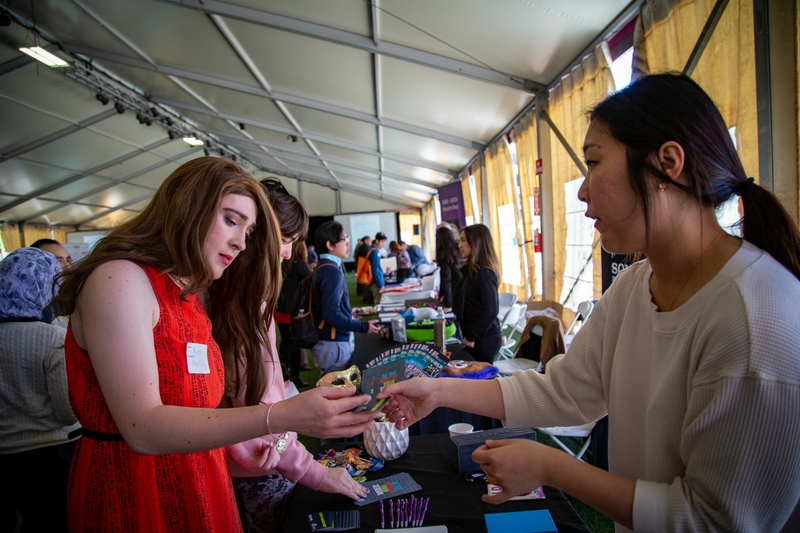 She rocks black heels on the astroturf floor, a choice she ends up regretting since the event is three hours long and she has six rows of employers to get through. Ashby has trekked from Orange County hoping to get a job in L.A. so she can quit the part-time work she does for her dad, whom she came out to as trans just four months ago. “He’s understanding in the manner of you’ll always be my son,” she explains, half deflated. Under the tent amongst fellow gender-diverse people, she can be herself. She wants to be employed that way. 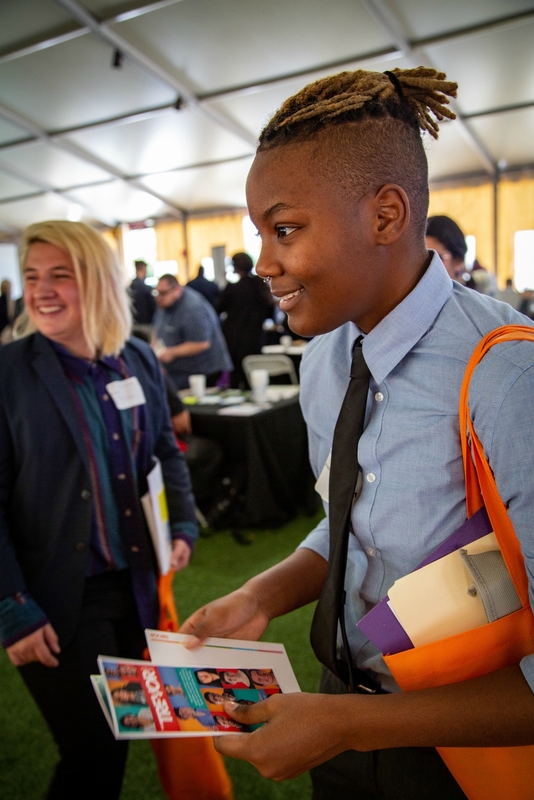 Navigating a job search at the fair is markedly different than putting in applications on the outside world for candidates like 19-year-old Joe Williams, who uses “they/them” pronouns. “It’s definitely hard, especially since I’m non-binary, trying to get employers to understand my identity is valid,” Williams says. Williams fills out a job application for Trader Joe’s and chats up the LGBT Center of Los Angeles. One day, they hope to own their own business. In the meantime, the dream is to move out of their mom’s house in Hawthorne and pay off student loans. For 24-year-old trans man Theo Tiedemann, the goal is the silver screen. He’s coming off acting an upcoming episode on the Amazon show Transparent, his first professional gig. He and friend Seth Gomez are at the fair looking for film jobs, but not having much luck. It’s exceedingly rare that transgender actors are cast in anything other than trans-specific roles and even then, non-transgender people are often cast first. “The point of getting [into] film was so I didn’t have to have a 9-to-5 being at a desk,” Tiedemann says with determination. Jason Hill, who organized the event for St. John’s, reports that more than 100 candidates are interviewed by the end of the day. Starbucks hires 15 people on the spot. Hill had aimed for 150 attendees—when more than 500 people show up, organizers run out of food and water. They take it as a sign that the event was even more necessary than they’d thought. After the fair, Ashby waits for an Uber outside and peels off her nametag; the pronouns don’t belong on the train ride home to Orange County. She’d hoped to secure two job contacts—instead she’s leaving with ten. She also has new group of transgender friends. Previous articleThe Best Ways to Celebrate St. Patrick’s Day in L.A.